By allowing outside food into multiplexes, the Maharashtra government might’ve just eaten multiplex companies’ lunch. 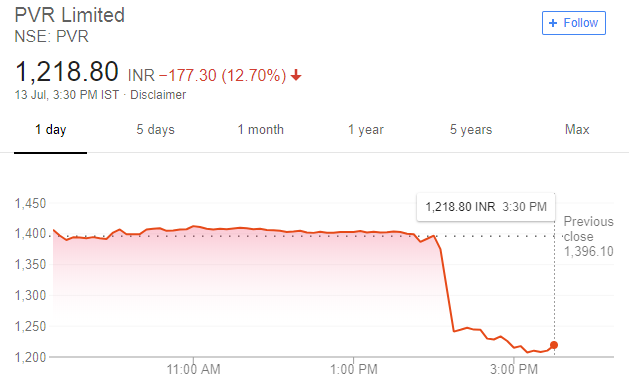 PVR’s stock fell 12% today in trade after the Maharashtra government clarified that multiplexes couldn’t prevent customers from bringing their own food into theatres. PVR had been trading at Rs. 1,400 at the beginning of the day, but dramatically fell following the announcement. Its stock now trades at Rs. 1218, a near 13% fall during the day. The statement that caused PVR’s stock’s precipitous fall was made by Maharashtra Food Supplies Minister Ravindra Chavan during the ongoing Assembly Session. He said that there is no restriction on taking outside food in cinema halls, theaters, and multiplexes, in response to a question from a member of the assembly asking whether outside food was permissible in theatre or not and whether there was any law on it. Chavan also said that there could not be two different prices for the same product. Multiplexes typically don’t let customers bring in outside food, and charge exorbitant prices for the food they serve inside. Chavan added that action would be taken against theatres’ employees and owners if people were not allowed to carry outside food. This news seemed to be hard to digest for PVR’s stockholders, and perhaps for good reason. Last year, a full 25% of PVR’s overall revenues were contributed through its Food & Beverage sales. PVR’s revenue numbers through the sales of Food and Beverage items can rival some serious restaurant chains — in FY17, it made Rs. 500 crore just by selling food and drinks. And these sales are more lucrative than similar numbers at traditional restaurant chains — given how multiplexes like PVR don’t allow outside food and are thus able to price their own offerings at whatever rates they please, they earn an astonishing 75% margins on their sale. A quarter of PVR’s overall screens are in Maharashtra, the hit to its stock price isn’t surprising. If people were allowed to carry their own food into theatres, sales of overpriced items would plummet, and theatres would eventually have to price their offerings at more reasonable rates to get people to buy them. This could cut off a significant portion of PVR’s revenue — while 25% of revenue is earned from advertising, only 53% is earned through box office sales, while a further 11% comes from in-theatre ads. And apart from long-standing convention, there doesn’t seem to be enough reason for theatres to not allow outside food in their premises. Multiplexes aren’t in the business of serving food, and should ideally not be concerned if customers bring their own food into halls. Not allowing outside food also seems discriminatory towards people who have specific dietary preferences, either for religious reasons or otherwise. And other industries which serve food don’t prevent customers from bringing their own — India’s budget airlines, for instance, provide paid food options on airplanes, but don’t actively prevent customers from bringing their own. The Maharashtra government appears to be taking a bold step towards getting multiplexes to play fair. It might be about time for the rest of India to follow suit.